I thought that since today is St Patrick’s Day it would be nice for the little ones to find a Pot of Gold waiting for them when they wake up. After all, isn’t that why we all love a rainbow? The promise that we might find some hidden treasure among the beautiful shimmering colours. 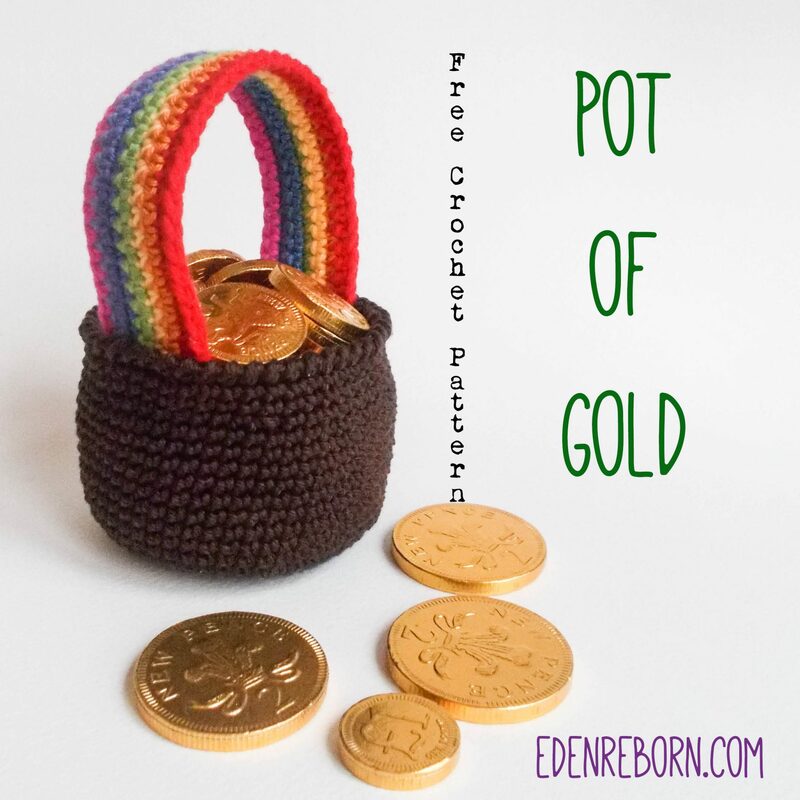 So without further ado, here’s a free crochet pattern for you to make your own pot of gold. 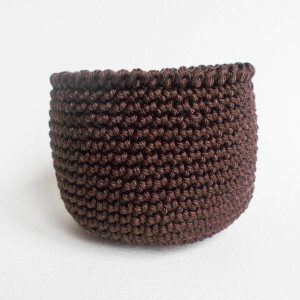 I used a double knit / light worsted weight cotton and a 2.5mm hook for my pot. It turned out about 13 cm / 5″ high from base to top of handle. Using a hook size 1-2 sizes smaller than advised on your yarn label will ensure your pot is nice and sturdy. Round 23: slip stitch in next 2 stitches (to even up your rows) then reverse single crochet in these 2 slip stitches and each stitch around until you return to the beginning. Work over your yarn ends as you go across each row to save lots of weaving in later! Row1: sc in 2nd chain from hook and in each chain until the end. Fasten off red. Row 2: With orange yarn, chain 1, sc in same stitch and in each stitch across. Fasten off orange yarn. Row 3: With yellow yarn, chain 1, sc in same stitch and in each stitch across. Fasten off yellow yarn. Row 4: With green yarn, chain 1, sc in same stitch and in each stitch across. Fasten off green yarn. Row 5: With blue yarn, chain 1, sc in same stitch and in each stitch across. Fasten off blue yarn. Row 6: With purple yarn, chain 1, sc in same stitch and in each stitch across. Fasten off purple yarn. 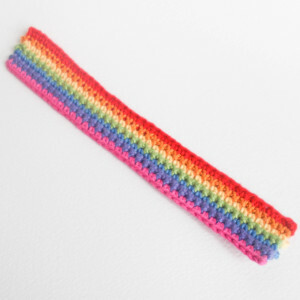 Row 7: With pink yarn, chain 1, sc in same stitch and in each stitch across. Fasten off pink yarn. Now at this point I wove in all my remaining yarn ends, which wasn’t very clever as it made more work for myself I’d advise keeping one yarn end each side to sew to pot. 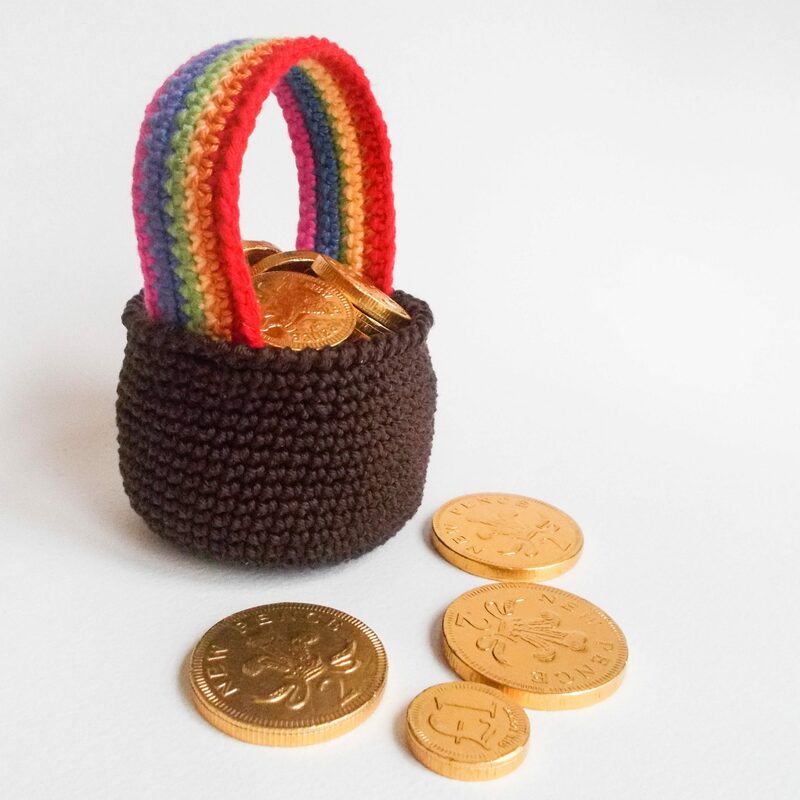 Fill with chocolate coins and enjoy! 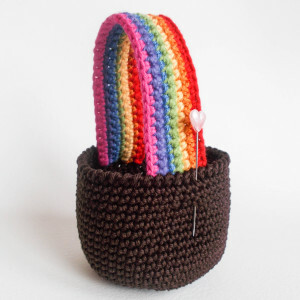 Posted in Crochet, Free Patterns and tagged Crochet, Free Pattern, Holidays, pot, rainbow, St Patrick's Day.